New Bemidji State women’s basketball coach Chelsea DeVille in the BSU Gymnasium. Bemidji State women’s basketball began a new era when it took to the court for its 2015-16 opener Nov. 14. In June, Director of Athletics Tracy Dill announced Chelsea DeVille as the 10th coach in the history of the program. A first-time head coach, DeVille is just over six years removed from being a collegiate student-athlete herself. She has injected the program with youthful exuberance while assembling a team poised to make big strides in 2015-16. The roster features nine returning players, including 2014-15 NSIC Freshman of the Year Sierra Senske. DeVille came to Bemidji State after serving on the University of Sioux Falls women’s basketball coaching staff since 2009. Following a year as graduate assistant under Head Coach Travis Traphagen, she was promoted to assistant coach beginning with the 2010-11 season and served in that capacity until she was elevated to associate head coach following the 2013-14 campaign. 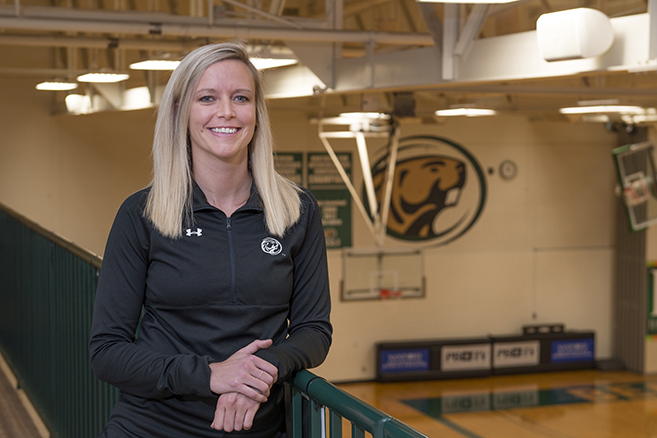 While at USF, DeVille helped the Cougars to an overall record of 111-64 during a transition from the NAIA to NCAA Division II and the Northern Sun Intercollegiate Conference. A NAIA powerhouse, USF posted a school-record 27 wins en route to a trip to the NAIA Elite Eight in 2010-11. Since making the transition to the NCAA, the Cougars have made two consecutive trips to the NSIC postseason tournament, which included a 17-10 mark in 2014-15. In addition to assisting in offensive game strategies and leading the Cougars’ defense and substitutions on game day, DeVille was the driving force behind USF’s recruiting efforts. She oversaw the team’s academic progress, was responsible for scouting the opposition, film breakdown, travel and the university’s youth basketball camps. A 2009 graduate of Augustana College, DeVille was a four-year starter and letter winner for the Vikings and earned the North Central Conference Freshman of the Year award in 2006. The Watertown, S.D., native has a bachelor’s degree in special education from Augustana and a master’s degree in educational leadership from USF.